I was born in Los Angeles but grew up in New York, New Jersey and Rhode Island. Sounds like you learned how to surf here and then were whisked away into exile on the East Coast? No, we moved when I was two years old. My dad went back there to work at some company and we moved around. Technically born in LA, but grew up mostly in Jersey. This is starting to make sense, based on this whacko theory I came up with in Chapter One, about skateboarding being born in 1947 and then hitting puberty in 1959. I thought that board was long gone, but then my parents sold that house in Los Angeles – right after the LA Riots. The Watts Riots in 1965 or the Rodney King riots? The Rodney King riots. That was 1992. My parents sold their LA house in the early summer of 1992. That’s when I found that 2” x 4” skateboard, which I hadn’t seen since 1960. They were clearing out the house and there was the board sitting there, covered in dust in the garage. But that trip from Jersey back to Los Angeles in 1960 is what got me into skateboarding. It didn’t exist on the East Coast and was just starting in LA and southern California. And that lead to everything else that happened to me. Tom Sims first skateboard. Horizontal view of the 1960s skateboard that launched a 70s/80s empire. Skate courtesy Tom Sims. Where in LA was this? Those first kids I saw were coming down Plymouth Boulevard right near Hancock Park – two blocks from the Ebell Theater on the cement sidewalks. I took a couple runs on my 2×4 skateboard and it worked really bad, but I still could feel the magic. I asked those kids where they got their boards. They told me to go to Sears Roebuck on Pico Boulevard in Los Angeles. My dad got me a Roller Derby or a Roller Sport skateboard, I can’t remember, but I do remember the price: It was $14.99. I don’t have that board anymore. I took it back east and showed it around to my friends and when I rode it people looked at me like I was an alien. No one had heard of a skateboard or seen a skateboard and you couldn’t buy them for a few years after that on the Eastern Seaboard. So I had to make my own skateboards when they broke or when my wheels wore out. I was dead without a skateboard. There were good Chicago trucks on my first board. They were durable, but the wheels wore out very quickly. My dad took me to this rough neighborhood in Camden, New Jersey. We went to a roller skating rink to buy wheels which were old used ones off the rental roller skates. The rink manager charged me twenty-five cents for wheels and five dollars for a pair of used old roller skates, which had great trucks. I bought a whole box of used roller skate wheels from that guy. I survived for a long time and started building skateboards for my friends – so I would have someone to go skateboarding with. I was building skateboards for buddies just to spread the fun. I could make two skateboards from one pair of roller skates. That was my first commercial enterprise – I just wasn’t charging any money. The hill I lived on was an unbelievably good skateboard hill – just paved with perfect asphalt. I had the ultimate setup growing up – a swimming pool in the backyard with Greenmount Road out front – everyone in town knew that was Skateboard Central. You were skateboarding your swimming pool? No we would play Marco Polo after skateboarding for hours on hot summer days. The pool was unskateable due to squared corners. In 1966 my dad bought me my first surfboard and that’s when my life changed even more, because I had rented surfboards the two previous summers and fell in love with surfing after just one wave. Now I had my own 9’ 4” Surfboards Hawaii nose rider. I was in heaven. Where were you surfing back there? The Jersey shore, mostly Long Beach Island and Ocean City. Even before that, back in 1963 I built the first snowboard. In the winter you couldn’t skateboard everyday in South Jersey, so I tried to figure out how to make a skateboard for the snow. All I wanted to do was go skateboarding so I made a snowboard in woodshop to cure my addiction. I called it a Skiboard, and subsequent wood shop classes kids started to make their own Skiboards based on my design. This is all years before the Snurfer. Haddonfield New Jersey had the only snowboarders in the world for at least three winters until the Snurfer hit the stores in 66/67! Skateboarding lead to everything for me: Snowboarding, Surfing, Skimboarding and Wakeboarding. I was living a “boarding lifestyle” long before the culture was born. Where did you live in Jersey? Haddonfield, across the river from Philadelphia. It’s a wealthy enclave of Colonial homes – where many of the Philadelphia Flyers now live. Haddonfield was a conservative, Colonial town. I got arrested just for skateboarding. I would love to get that police report. inspired by kids he saw in the streets of Los Angeles. What year did you get arrested? Right at the beginning. Right in that 1960, 1961 era. Skateboarding is not a crime. You could have been the first. They threw me in the squad car and they didn’t even know what skateboarding was. It was on my record, and my mom and dad were concerned: “What’s that thing you are using in the streets?” I told the police it was a skateboard. They huffed and puffed and kept staring at me as if I was a crook or something. At what point did your fascination and avocation start to become a profession? I started building four-foot skateboards in the mid-Sixties, to simulate surfing. At the time, surfboards were all over nine feet long so on those four-foot skateboards I could walk the nose and do kickturns and all that stuff. That went on until the late 1960s, when the short board phenomenon hit surfing in Hawaii, Santa Barbara and Australia. That too changed the world of surfing and even skateboarding. I started building surfboards in my parents’ garage which were the first short surfboards on the East Coast. Were you doing this all in a vacuum? I was following Surfer Magazine. I’m trying to think when I first saw a SkateBoarder Magazine. Can’t remember. My magazine collection was lost in a flood some years back here at our ranch. I moved to California in 1971to find better waves and better skateboard hills, but I can’t remember when I first saw a skateboard magazine. I was just a skateboarder/surfer guy living in the foothills of Montecito outside of Santa Barbara. No TV, no radio – a little adobe hut for $50 a month. No bathroom, no shower. I used a hose for a shower and we had an outhouse. My whole life revolved around skateboarding, surfing and snowboarding. By the mid 70s, I started building three and four-foot ash skateboards to sell, and my first dealer was the Channel Islands Surfboards shop – ironically now owned by Burton. 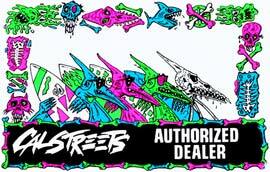 My second dealer was Val Surf in the San Fernando Valley. Because Burton and I became fierce competitors in the snowboarding business years later. By 1976 I was selling Sims Skateboards in Japan Europe and Australia. We had several hundred dealers all screaming for more product. It was really hard to keep up with all the orders. What were you selling exactly? Those three and four-foot wood skateboards and then the 30-inch fiberglass boards that were like the Bahne boards. I couldn’t keep up with the wooden boards, but we could do unlimited fiberglass decks from a company in Burbank called Ampul Corp. I remember going to their factory and smelling all the resin and seeing fiberglass dust fill the air. I jumped on a plane to Toronto and the rest is history. Thus spake Tom Sims: “The bottom board is one of my first production prototype four foot skateboard, which I test rode as one of my personal boards in 1972/73. The four-foot skateboards I had made in the mid 60?s were actually rectangular! The top board is one of the first production boards I was building myself to sell to the surf shops. 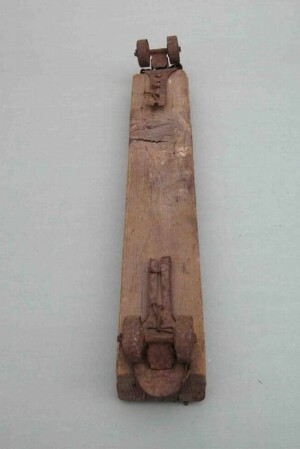 The wheel wells are likely the very first wheel wells ever. The sand and resin textured top was the first skateboards with grip – which was the precursor to grip tape.” Boards courtesy Tom Sims. You couldn’t keep up with the wood orders? 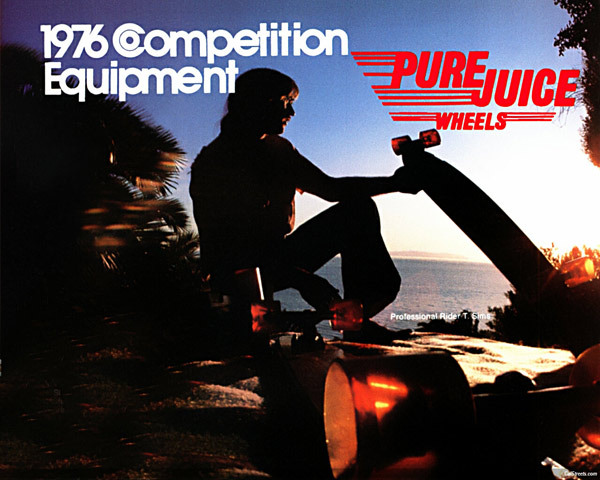 I was hiring “Mountain Drivers” (local people from Mountain Drive in Montecito) with band saws to cut them out, and then eventually in the mid 1970s somewhere I had to start buying fiberglass skateboard decks from Ampul. We would silk-screen the Sims name and sold them as ‘completes’. I was buying skateboard trucks from some guy in Laguna Beach and then some hardware and stuff from Con Colburn down in Venice. I was buying ACS trucks and Metaflex wheels and eventually ACS and Bennetts. And then finally it was just Gull Wing, Tracker and Indy. I have all these old price lists and ads that are kind of classic. I virtually worshiped skateboarding and the whole experience. So basically what happened was from the early 70s I was kind of a guru of skateboarding. I mastered the hills of Montecito and the Tea Bowl – an iconic skateboard reservoir I found a few miles straight up the mountain from the swanky Biltmore Hotel. There was a huge reservoir built by a wealthy woman in the 1920’s, but it was now empty – luckily for me and my friends. And I was pretty much the undisputed founder and ruler of the Tea Bowl. I believe there is a scene in the movie ‘Freewheelin’ with Stacy Peralta and I at the Tea Bowl. By 1977 CR Stecyk and SkateBoarder Magazine were referring to me as “The Godfather.” It was around this time that George Powell called SkateBoarder Magazine concerned with all the Sims exposure and said: “Sims must be paying you bribes.” He also said: “Whatever Sims is paying you I will pay more.” Warren Bolster, the editor of SkateBoarder magazine told me this story many times just laughing out loud hysterically. During this era I was driving down to the different contests in So Cal and winning most everything the Sims team and I entered. That all peaked in 1975 when I won the World Skateboarding Championships. 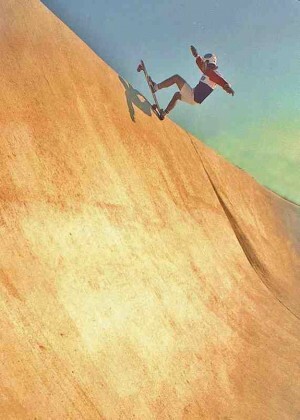 Tom Sims taking one of his mid-1970s longboards to the top of a California reservoir – sucked bone-dry by drought. Photo courtesy Tom Sims. The Hang Ten World Skateboarding Championship down at the LA Arena in September of 1975. When I won there I was on top of the world, then all of a sudden Tony Alva comes along and dethrones me within a very short time. He won the World Championships in a following year and then all of a sudden Alva skateboards were in huge demand. I had to work hard just to sell skateboards after that, because so many wanted Alva due to his mystique and prowess in empty pools just as the Dogtown movie depicts him. He really was the best pool rider of that era. He changed the whole paradigm for me and the sport. One moment I couldn’t make skateboards fast enough, and then when Alva came along, I had to work to sell skateboards, because everyone wanted Alva. He was an earthshaking phenomenon. Sims dominated the skateboard mags and then Alva came along and took over, there and in the magazines and the business world. And I was willing to sponsor them – especially Jay and Biniak and the other guys – because they had surfing as their underlying motive for skateboarding. They rode skateboards as if they were surfing and had a style I loved too. I couldn’t relate to the San Diego skateboard scene – the freestyle thing and only doing 360s and click clacks and this and that. We were looking for banks and bowls and pools. So I related with the Dogtown guys. We did photo shoots in drainage pipes and we’d go to Hemet and all the way to Arizona – to Big Surf in Tempe. We hung out and skated places like the Escondido Reservoir – any ditch or pool we could find. Many times SkateBoarder or Transworld, or Thrasher Magazine staff showed up as if it was ‘in the wind’ that the Sims team was riding somewhere. My skateboard team riders were mostly Ventura and Venice-based surfers: Stevie Monahan, Frank Blood, Davey Miller, Richie Vanderwyk and John Drury and the Venice Rats. Lots of those guys were hot surfers, so it made sense for me to sponsor those Dogtown guys for a while. It felt right, and everything was going great and then… Muir busted off to officially form Dogtown Skateboards. I had to say bye to my Santa Monica and Venice crew. 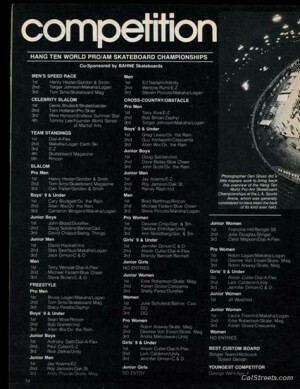 Published in SkateBoarder 2#3, the results of the Hang Ten World Pro/Am Skateboard Championships show Tom Sims placing in the Top Three in three divisions – and also who was riding for who in September of 1975. Ad courtesy Jim Goodrich and Surfer Publishing Group. I was on the short lived Northern Cal team, I remember going with a guy named Alien to pick up Jay Adams from the airport for a Winchester contest.